For my La Haie Sainte project, I needed 2 regiments of Cuirassiers and I do have plans to do a second. But as an aside, I said to myself let's paint just one figure as those red-plumed fellows. Well I could not stop and here we are. 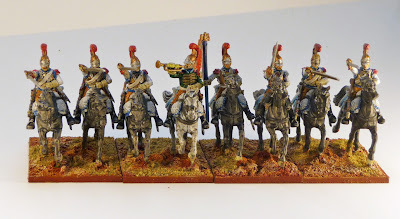 I believe I enjoyed painting this cavalry unit more than any previous, I may even expand it to 12, but we will have to see. I have 8 more figures left from my second Perry box of heavy cavalry and they are slated to become the 1er Régiment de Cuirassiers. I have said it before, but I will say it again, these are first rate figures and I endorse them without reservation. I believe I got most of the uniform and the horses right, although I do note that the plume on the helmet of the trumpeter in the above sketch is white, might change it after more research. 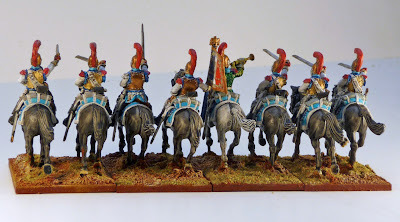 I used alcohol based metallics on the helmets and the cuirasses. Vallejo puts out a line called Oro Liquido, and they are just fantastic. On the officer's cuirass, I used red gold and on the troopers, I used plain gold. It is a little tricky to use, you put on a couple of brush strokes and then you have to re-stopper the bottle and give it a good shake to carry on. The paint just falls off the brush and has an almost perfect viscosity with an excellent spread and coverage pattern, remember I am painting over white and this is a single coat. It dries almost immediately. Highly recommended! The flag came out of the Perry box and with a touch up, it looks quite nice. Hopefully, you can see the difference between the two gold colours. I really like that red gold. And finally, before Old Anonymous puts his 2 cents in, I do know that this is not the 1815 Carabinier uniform, but I found the white and sky blue just irresistible. Well, I am going to take a little break from painting and start to work on my La Haie Sainte scenario. I have just finished re-surfacing my terrain boards (I will put up a post soon) and it is time to do something different. Let's hope that I have enough KGL Light/95th figures for the scenario. More to come! Beautiful work, John. I'm definitely going to have to try that metalic paint. 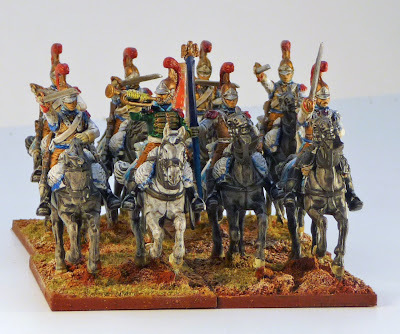 Thay look great - the best Napoleonic cavalry type in my opinion! Really lovely, John! You're going through a purple patch at the moment, churning out unit after unit!. They are VERY pretty cav John - paint 'em the way you like I say! Leave the right number of buttons etc to the pedants - just keep enjoying your painting, which you obviously do, given your prodigious output! Very nice figures as always! 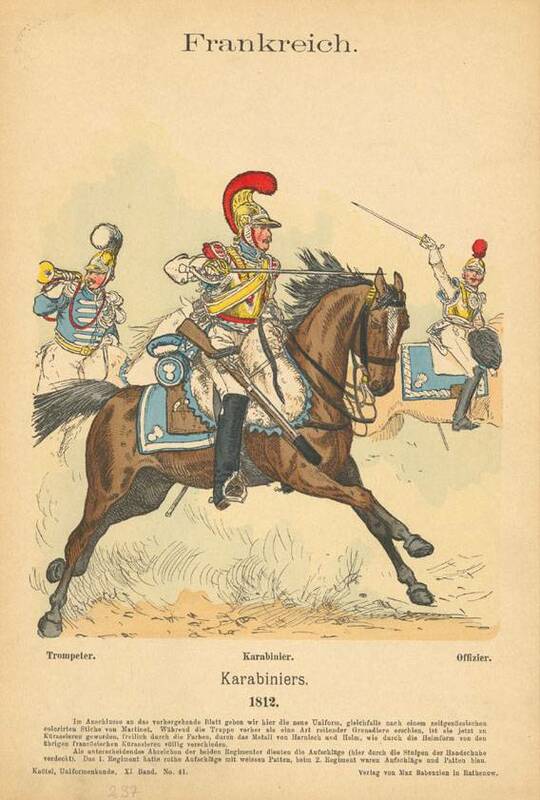 The French carabiniers have an additional advantage: the first and second regiments were virtually indistinguishable on the field, when the men wore their white gloves! 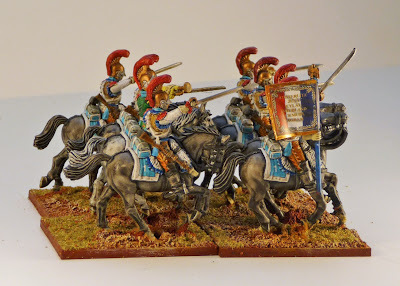 These are great looking, Brilliant the effect you get on the horse too. How is it you are doing them? is it various a wash over white? The golds look really cool too. Thanks for the compliments, they were fun to paint. Paul, the horses are all done with various washes or inks over a white primer.